I was originally hoping to get to the Grey Cup in Ottawa this past weekend, but circumstances did not permit. Rather than mope around at home though, I found an event a bit closer that allowed me to add a new venue and see some old friends. 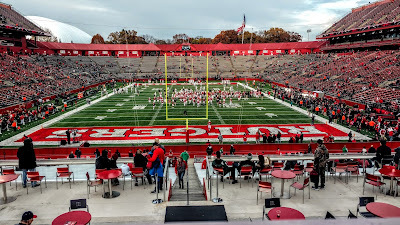 The Rutgers Scarlet Knights were hosting Michigan State at High Point Solutions Stadium and I joined my friends Mike and Gary from Royalty Tours along with Sabre Mike Carroll for the afternoon. 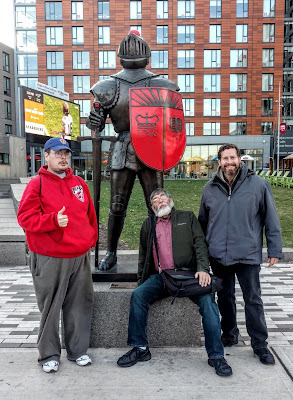 After taking a NJ Transit train from Penn Station to New Brunswick, we walked along College Avenue, stopping at a local pizza joint before boarding a shuttle bus. 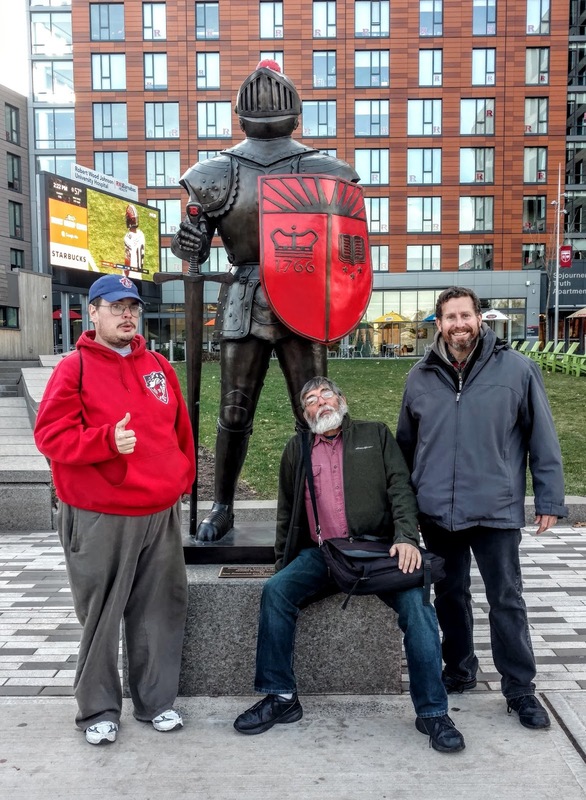 Along the way, we saw a knight with a scarlet shield that made for a great photo opportunity. Sabre Mike on the left is sporting an Ottawa Champions cap, apparently in my honour. 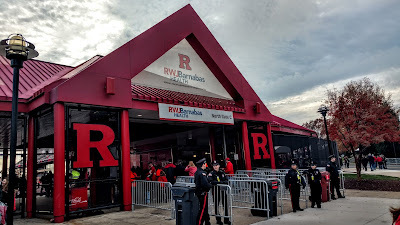 The shuttle bus leaves from in front of Student Center (other buses leave straight from New Brunswick Station if you don't want to walk) and takes about 10 minutes to reach the stadium. You are dropped off on the other side of River Road, which allows you to take a photo of the south entrance from a distance. 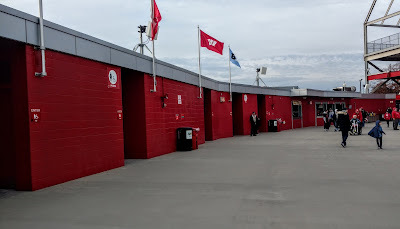 You can enter here, or walk to the left up a fairly steep path to get to the west entrance. This is where you will see the main bragging point of Rutgers, namely that it is the Birthplace of College Football. 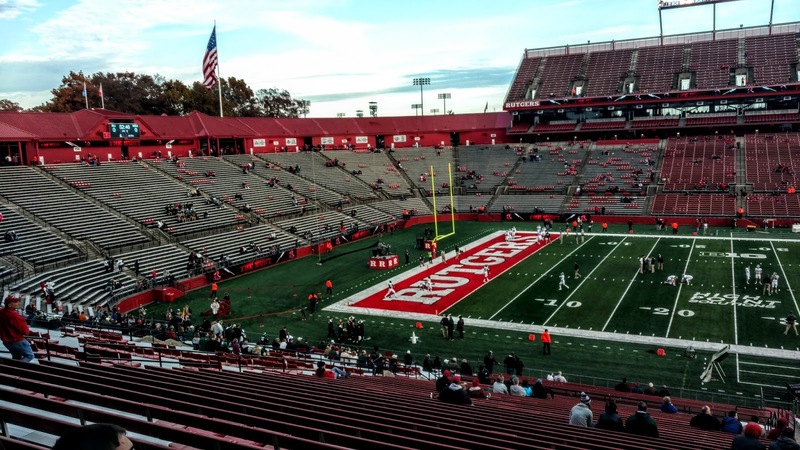 The first intercollegiate football game was played on November 6, 1869 at College Field at Rutgers (now a gymnasium and parking lot), with the home team beating Princeton 6-4. 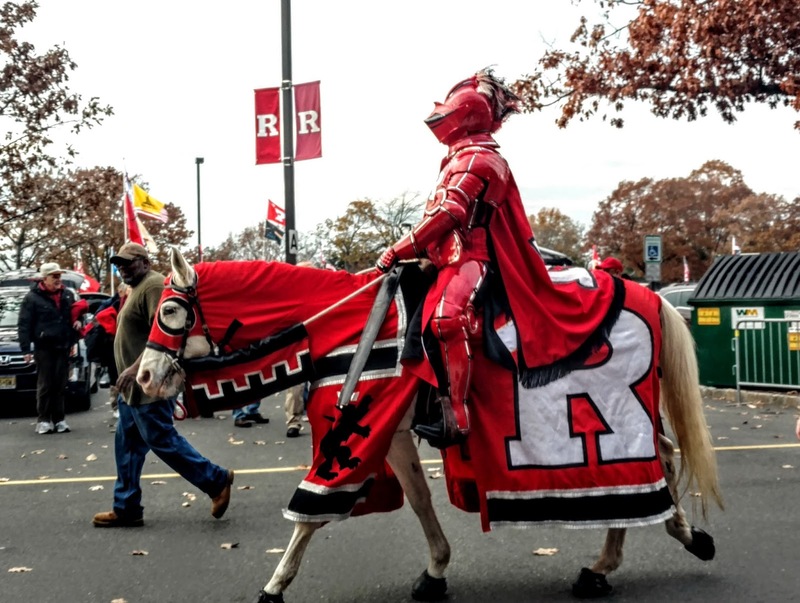 Despite this historical claim, Rutgers football has not been very successful in the last century. 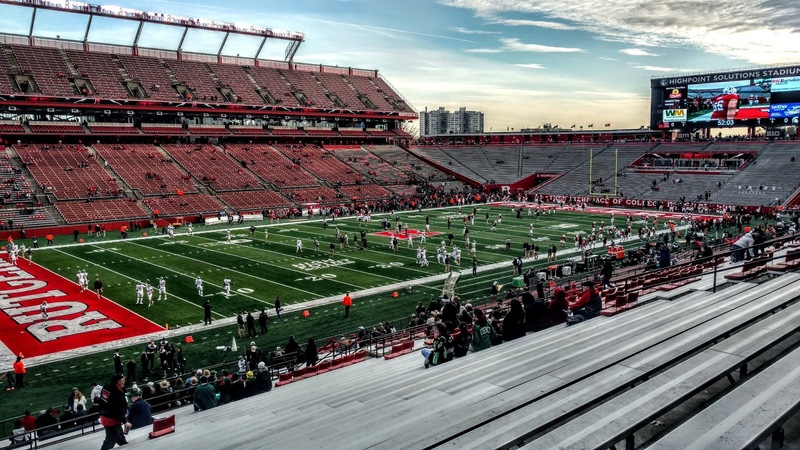 In 2006, they were ranked 7th on their way to an 11-2 season, but they moved to the Big Ten in 2014, and are now pretty much an afterthought in college football. 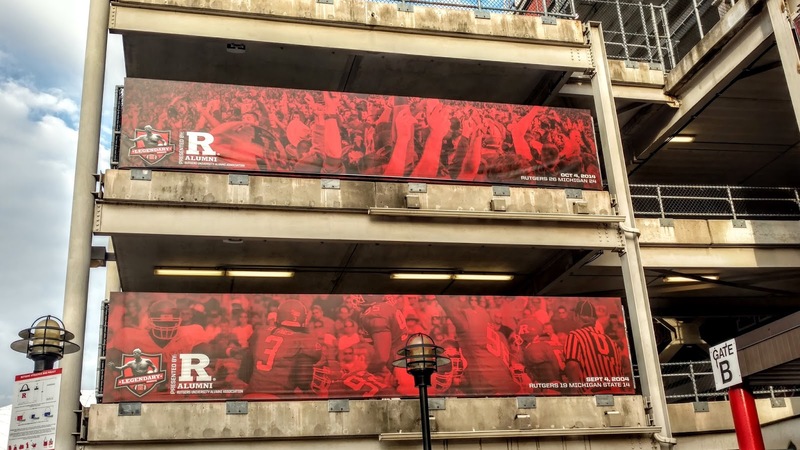 Still, they have had a few big wins, and those are commemorated with posters hiding the ramps to the upper level. 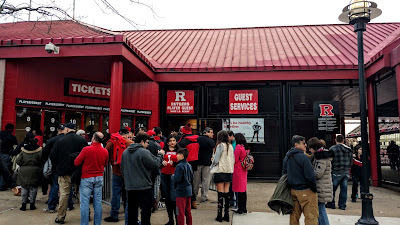 Keep walking around to the north end for the box office. There are plenty of scalpers but if you wait, you should be able to get in for free as long as the opponent is not Ohio State or Michigan. 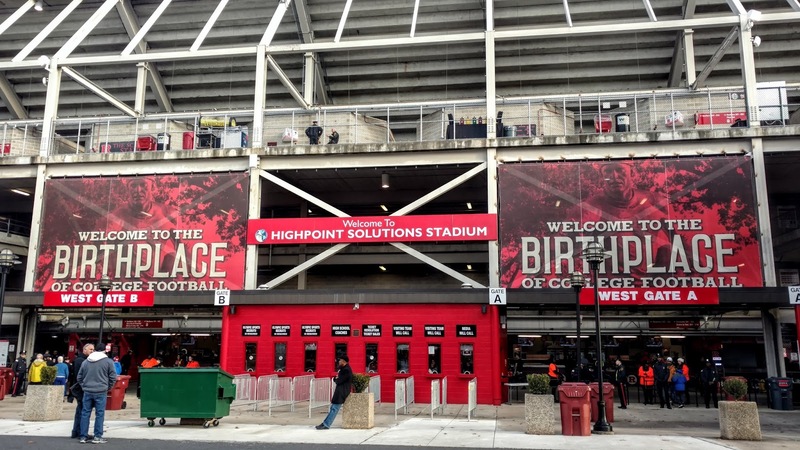 Every entrance is different; the north entrance (Gate C) is sponsored by a local health provider. Yes, in America, health providers are in competition. Before entering, I returned to the west entrance and shortly thereafter the band passed by. They stopped right in front of us and played a quick tune. 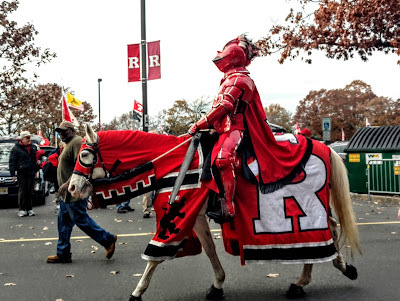 They were followed by the Scarlet Knight on his (or her) horse. With the outside ceremonies complete, I went in to take my tour. 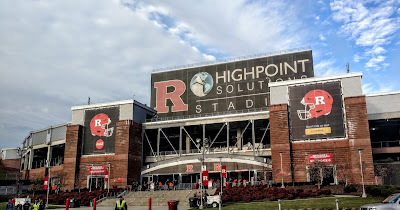 High Point Solutions Stadium was opened in 1994 and originally called Rutgers Stadium before the naming rights were sold to a local business technology concern in 2011. 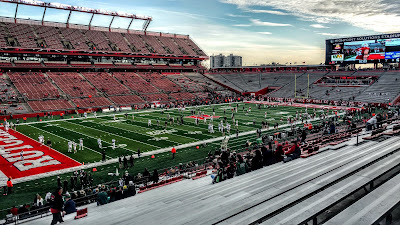 Capacity was 41,500 until a 2009 renovation added just over 11,000 seats in the south end zone, pictured below with the scoreboard above. All the seats are benches, though those in the middle sections of the lower bowl (in red below) have backs. 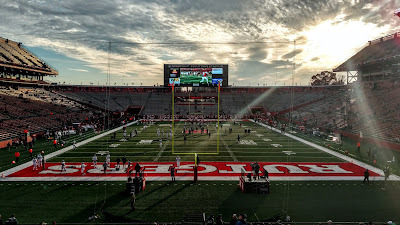 The view below is from the north end zone, with the sun setting to the west. The game was a 4 p.m. start, which was rather odd for this mostly meaningless affair. 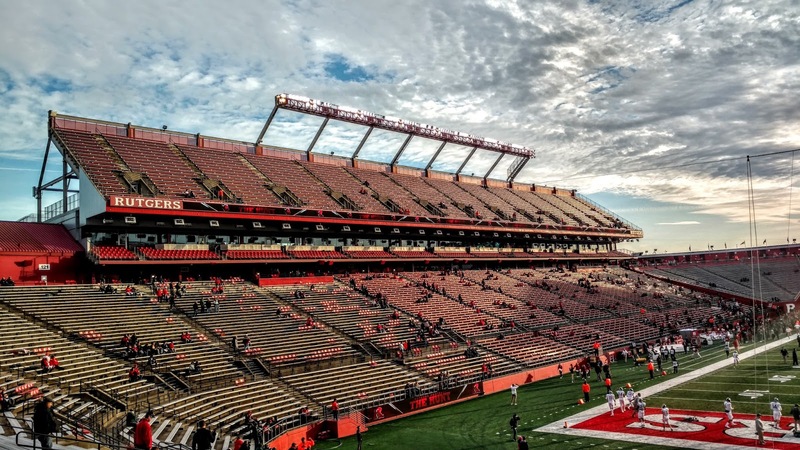 The upper deck should be avoided, particularly under the lights as pigeons or seagulls roost there during the week and the benches below are completely covered in bird poop. 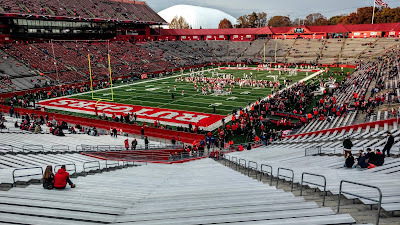 Below is a panorama shot from the top of the upper deck on the east side of the stadium. Below is the southeast corner, with the Busch Practice Bubble in the distance. A few steps to the left and you are looking directly north, with a small party area taking up a portion of the seating bowl. 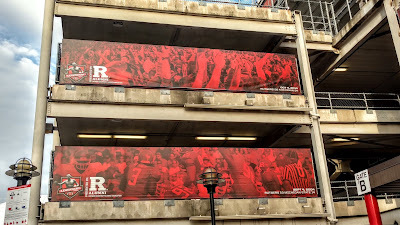 It is impossible to tell from the photo, but the far wall holds plaques for all the Rutgers bowl games. The concourse back here is quite wide, with the flags of all the Big Ten teams on poles attached to the wall. 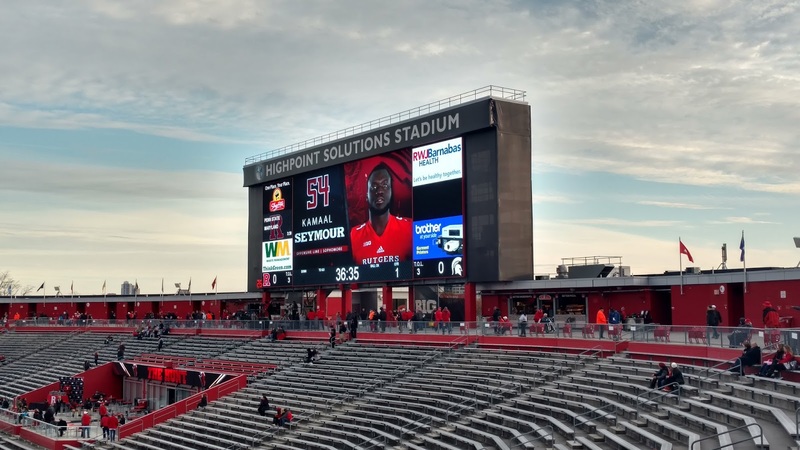 A different view of the scoreboard and the small party area is below. 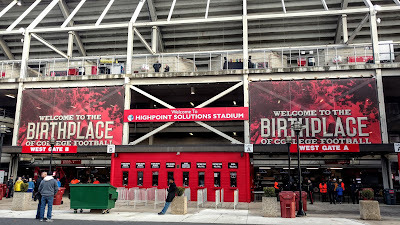 Overall, HPSS is a decent venue that suffered on this day from a terrible game and poor attendance. Should Rutgers ever become good again and the crowds return to support them, the stadium would be a much better place to visit. 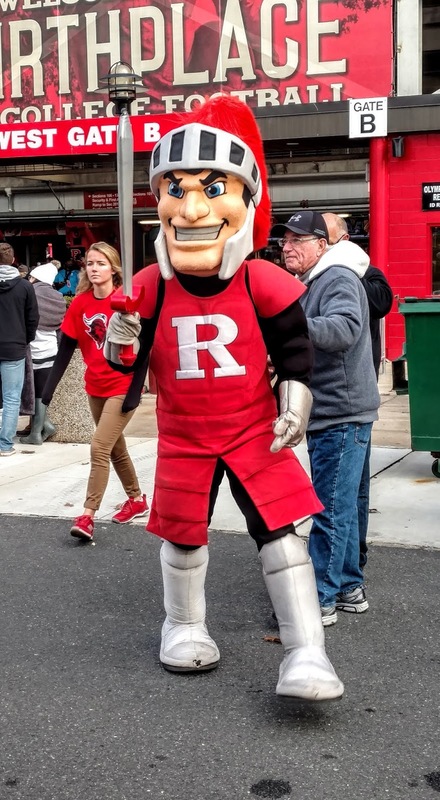 Michigan State came in ranked 16th in the College Football Playoff at 8-3, while Rutgers was 4-7. 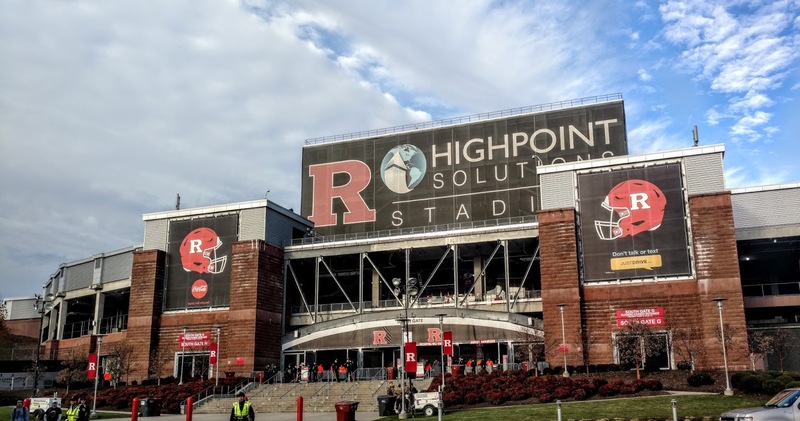 A blowout was expected and that is exactly what happened. 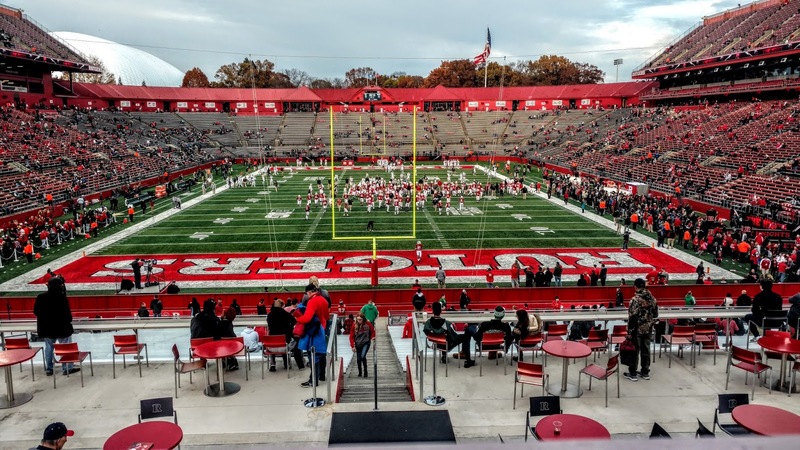 Rutgers won the toss, elected to defer, and the Spartans immediately marched down the field, scoring a touchdown when Brian Lewerke hit Connor Heyward with a 7-yard pass. 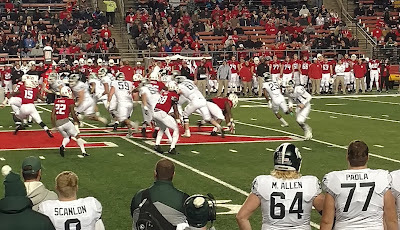 On Rutgers first play from scrimmage, Gus Edwards fumbled and MSU recovered on the Rutgers 8. 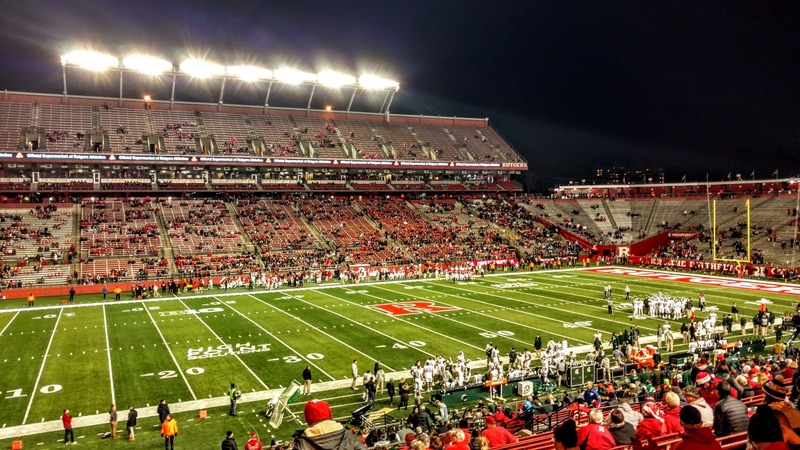 The Scarlet Knights defense held the Spartans to a field goal, but on their following possession, their offense gained no yards and punted. 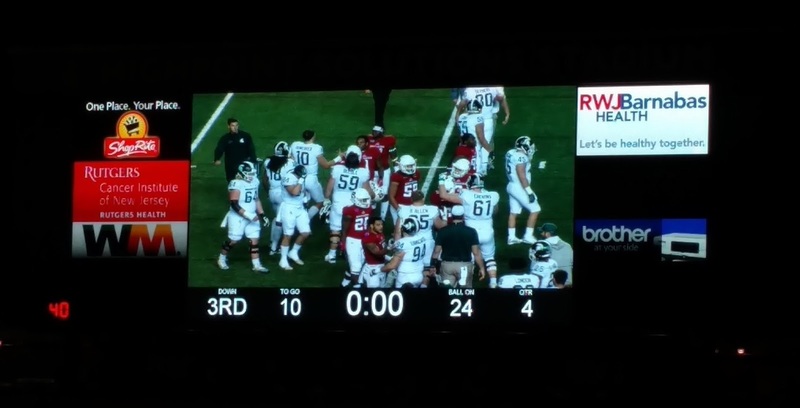 Again Michigan State drove, and again they were held to three points. 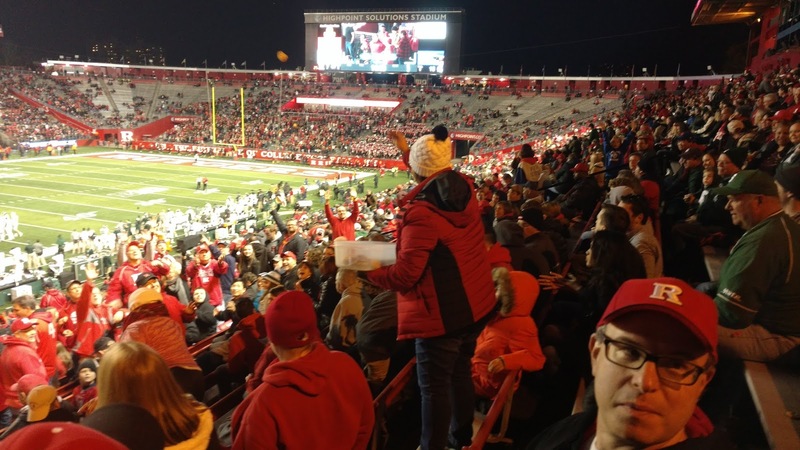 It looked like the blowout was starting early, but Rutgers scored an improbable 42-yard pass-and-run touchdown early in the second quarter to make it 13-7, and give the home fans something to cheer about. But that was all they could muster. Michigan State added a field goal in the second quarter to go into halftime up 16-7. 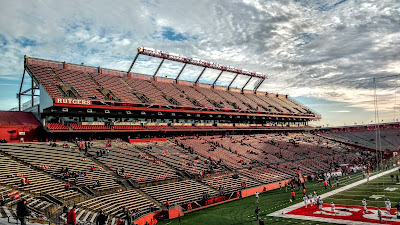 During the break, I went down to meet a friend sitting low at midfield and stayed for the first couple of series of the third quarter, where I took the picture above. 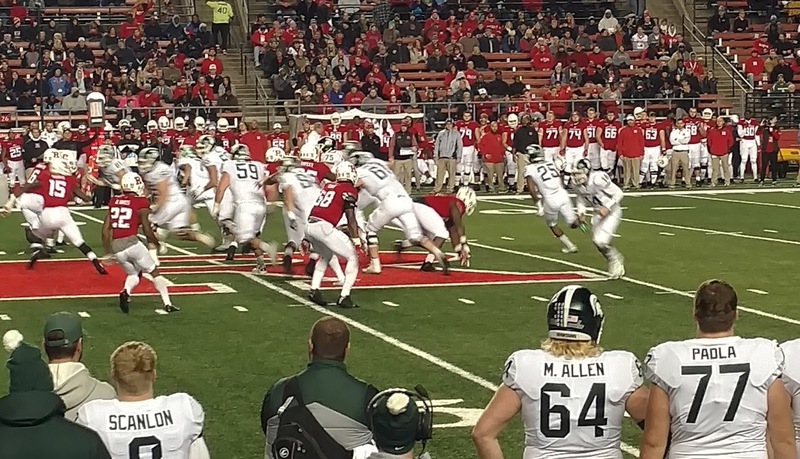 The Spartans added yet another field goal during that time to make it 19-7 at the end of three. 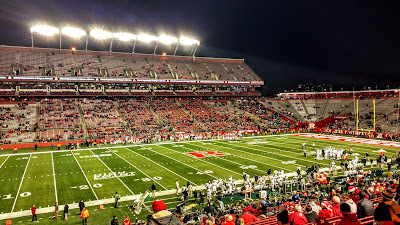 Even though the blowout had yet to appear, many fans had seen enough and hightailed it for home, as you can see in the photo below, taken early in the fourth quarter. They were the smart ones, as the Spartans blew the game open with three touchdowns in the final frame to win 40-7. I stayed until the end so I could capture the final score. Rutgers had only five first downs in the game and held the ball for just 12:10, while MSU went 13-21 on third down conversions. 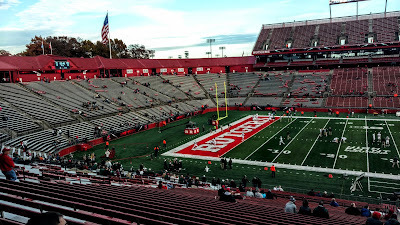 I could go on, but suffice to say that this was not the most exciting football game I have ever seen. The two mascots are quite similar, though the Rutgers one is smiling for some reason, while Sparty is grumpy. Given the result, their expressions should be reversed. After the Rutgers touchdown, a lady in the row in front of us started tossing homemade cookies to everyone around. According to a season-ticket holder, this happens every game. 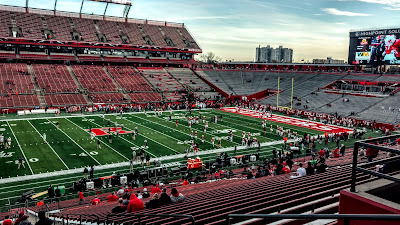 Sit near the back of Section 107 and hope for a Rutgers score if you want a free cookie or two. Brilliant recap as always, Sean. Like all the small observations you make, like the health care provider, the fark lol. Thanks as always for your comments. 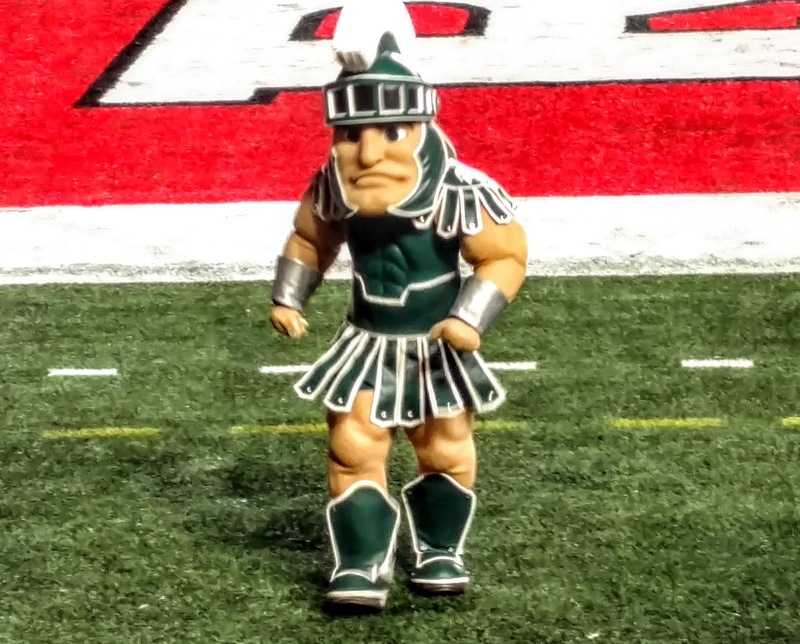 That lady was not appreciated by the Michigan State fans, some of who threw the cookie back at her! I feared a food fight, but the lady just kept throwing cookies at more receptive fans.